Having difficulties with pie crust shrinkage? Look no further! Follow these 6 easy tips to troubleshoot the problem and you will create the perfect crust every time! I frequently get questions in the comments here and on my social media sites regarding baking science and/or technique. While I do my best to answer each question, some of them I get often enough that I think the general baking internet world might benefit from the answers too! How do I Stop Pie Crust Shrinkage? This is a great question! A question I didn’t know the answer to not that long ago. It has taken me baking a lot more pies and getting more comfortable with pie crust to really understand how to prevent this. My approach to figuring out baking solutions is to really understand what is causing the problem. With pie crust shrinkage the problem mainly lies with gluten and development of gluten and the good news is, the solution is really easy! So, here are my 6 easy tips for troubleshooting pie crust shrinkage! 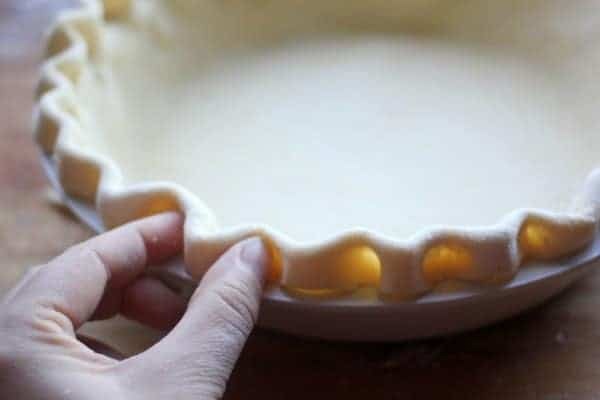 This technique can be used with any baked pie crust, including my favorite recipe for Easy Basic Pie Crust. 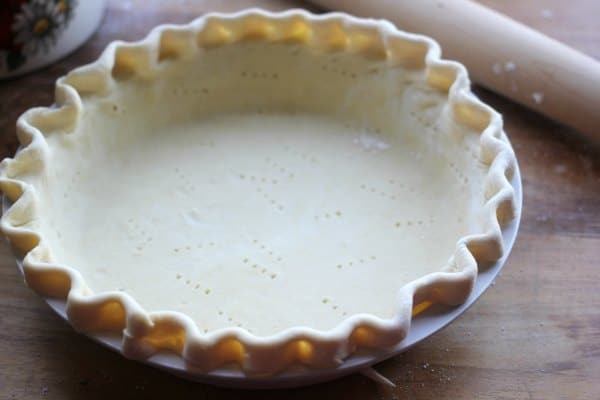 Note: If you are brand new to making pie crust, check out my article How to Make Pie Crust, The Complete Guide first! Tip #1- Do not overwork your dough. Pie crust is meant to be delicate. Think of it as the polar opposite as crusty, chewy bread. You want it to be tender and flaky. What happens when you add liquid to flour and start working it together is the protein strands begin coming together and aligning themselves. The more your knead or fuss with the dough, the stronger these bonds become. For pie dough, you want to keep these bonds weak. Tight gluten strands are going to lead to a tough chewy crust that will shrink when baked. Tip #2- Let your dough rest. Have you ever tried to roll out a pizza dough right after kneading it? Pretty impossible right? The dough snaps back immediately and refuses to become wide enough for your pan. BUT I bet if you were to let that dough rest for 10 minutes before rolling it out it would be infinitely easier. Resting time between creating your dough and shaping your dough is important here. For a pie crust we want to roll it out as gently as possible. We don’t want to force it’s shape and try and stretch and pull it to get it to the right size. 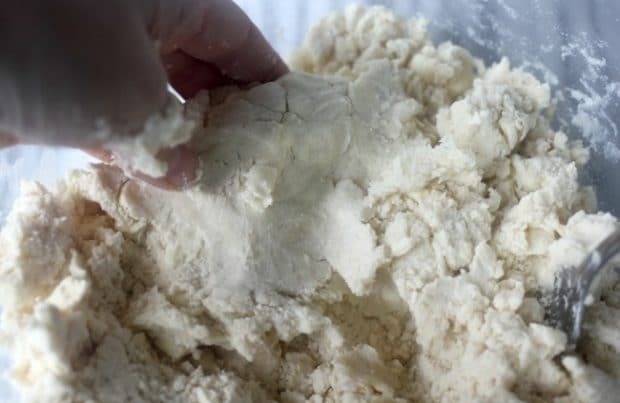 After you mix your dough, you should let it rest in the refrigerator for at least an hour. The main purpose of this is let your flour finish hydrating and to firm the fat back up, but it also relaxes the gluten strands. I like to form my dough, gently pat it into a disk, then cover it and let it sit in the refrigerator for at least 10 minutes, sometimes more. The time allows for the gluten strands to relax and will make the dough less elastic when rolling out while the refrigeration keeps the dough cool so we get all of those lovely air pockets from steam when the crust is baked. Start in the middle of the disk and roll out then return to the center to roll in the other direction. Do not go back and forth all across the dough stretching it. Tip #3- Do not stretch your dough. You see how much wider that crust is than my pie plate ^ up there. That’s what you’re going for here. You want a good amount of overhang because remember, it has to fill in the bottom and up the sides and you don’t want to stretch it to make it fit! 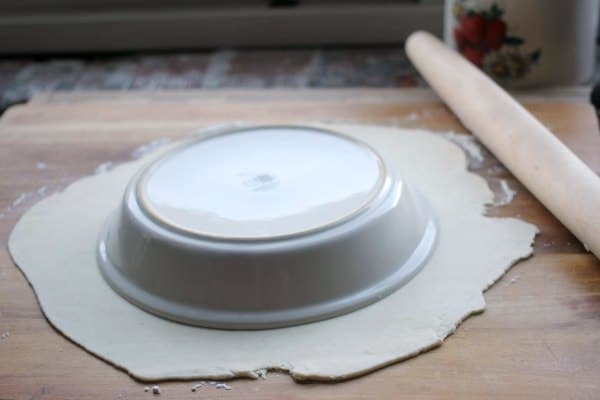 Roll the dough to about 3″ wider than your pie plate. Then when you transfer it into the plate lift up all the sides and lit it gently fall it. Do not stretch the dough to get it to fit! In my opinion, stretching the dough to make it fit in the plate is the biggest offender for causing a crust to shrink! See how the dough loosely fits in this plate. It is cozy and relaxed. It isn’t taut and hasn’t been pushed and pulled. This is what you’re looking for folks! 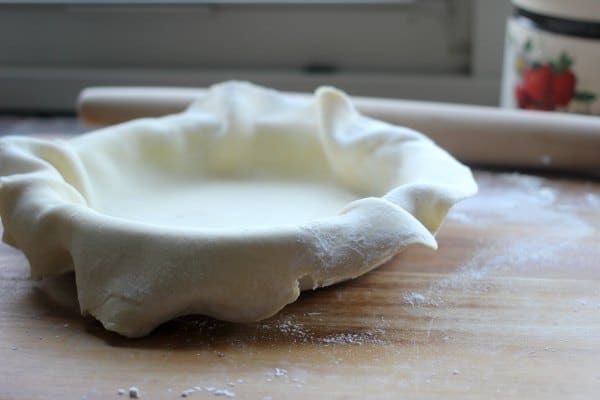 Note: These tips for reducing pie crust shrinkage, especially the one of not stretching the dough to fit your pie plate, will also work with store bought pie dough such as Pillsbury pie dough. Tip #4- Trim your crust wider than you need. Ok, so here is the kicker. Your crust is still going to shrink. But just a little bit. Even when you do everything correctly to prevent the crust from shrinking it is going to shrink slightly, so do yourself a favor and make it a little bit wider than you want your final outcome to be. Tip #5- Let it rest again! Just like we needed to let the dough rest before shaping it, you want to let it rest again after shaping it. Letting the gluten strands relax again will reduce the amount of shrinkage you get once the crust hits the oven. I like to pop the crust in the refrigerator while the oven preheats and as soon as the oven is ready your dough has rested enough to be ready to bake! If you remember from my basic pie crust post, you want a cold dough to go into the oven. The cold pockets of fat in the dough will create the flakiness as the moisture evaporates out. Once you are ready to bake you want to weigh down the crust to keep it in place. If you are baking the crust with a filling in it, then your filling is obviously your weight. But, if you are blind baking (aka, baking the crust without a filling) then you need to weigh it down. Lay a piece of parchment paper in the crust and fill it with dried beans, rice, or pie weights. There you have it. Simple right? I hope you found this beneficial! And coming up this week I’m giving you the recipe for that Fresh Strawberry Pie that you see up there! Yay! I love these tips! Thanks so much for such great tips! I’m going to follow them all – I have also pinned and shared on my own community page. It’s a pleasure to come to your page and know d nuances of baking. There was a time when I used to do a lot of baking but these days not much. However I gave your reference to my daughter who z a regular on your page. Thanks Betty and keep it going. Stumbled into your web pages and felt I landed the best novel ever. Chapter after chapter of educational tips and “how to” that is clear and concise. I’m 77 and now I know why my pie crust has had a mind of its own. Finally an answer to the shrinking crust. Many thanks and looking forward to the strawberry pie recipe. You’re very welcome Heather! Hope it helps! I think you have nailed this problem. As a pie baker for >>50 years, shrinkage has caught me more than once, eps. with open pies that need the HEAT. These ideas seem to work and THANKS! You’re so welcome, Cook! Happy to help! Let me know how it goes, Judy! I can’t thank you enough for this video! I have read blog after blog, cookbook instructions, took advice from co-workers, relatives and neighbors and I COULD NOT make the crust come out right. Everyone said I overworked it, but based on the pictures I saw, I disagreed – UNTIL I WATCHED THE VIDEO!!! I was definitely over working the dough. Also – you are the FIRST person to include that you need the dough to come back to room temperature before you roll it out. I am thrilled to report, I finally made an apple pie I am proud of and it got RAVE reviews. THANK YOU, THANK YOU, THANK YOU!!! I’m so glad to hear that you found this video helpful! That is just so great!